Ellison the Democrat party cochain has mountains of real evidence upon of his girlfriend! Not a peep of Democrats in regards to the outrage of that abuse .. instead they go full throttle son a man in which no evidence exists of a crime and the accuser’s statements change by the minute, but when it comes to Trump’s SCOTUS nominee thy are all in! Today Megyn Kelly gave her opinion on this drama made up by the Dems! 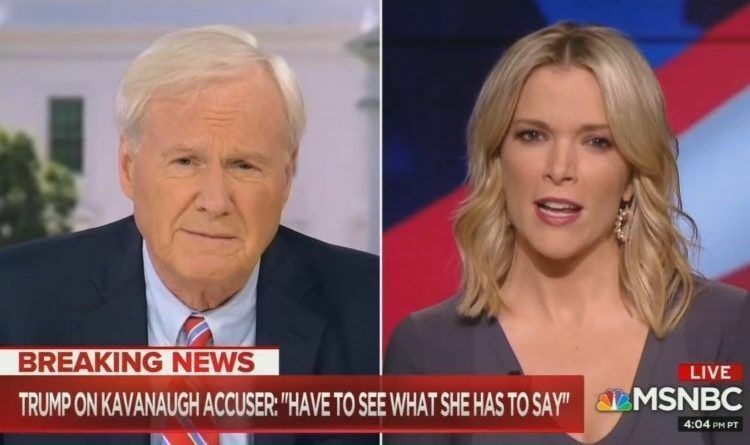 What do you think of where this is at right now tonight with all these demands from the witness, the accuser, and the insistence of the committee that they’re going to go ahead on Monday take it or not?” Matthews asked. “I think Dr. Ford is running out of options,” Kelly bluntly told him. “I think she needs to show up on Monday and offer her testimony if she wants to be heard because for better or for worse, she is not in charge of this. The Senate is in charge of this. That committee is in charge of this and their obligation is to provide advice and consent to the president on his judicial nominee so they get to decide what will inform that decision,” she continued. She’s rejected all of those. Senator Cornyn is right. She isn’t in a position to demand protocols. It’s not her right,” Kelly concluded. I agree with Megyn on this one but I have to add somwething more! She wanted to remain “anonymous”.. so why NOW? George W. Bush nominated Kavanaugh to the United States Court of Appeals for the D.C Circuit…she said nothing. May 11, 2006: The United States Senate Committee on the Judiciary recommended confirmation. Kavanaugh confirmed by the United States Senate…she said nothing. June 1, 2006: Sworn in by Justice Anthony Kennedy…she said nothing. 2012…she “remembered” something happened in 1982 yet she said nothing. 2018: With Kavanaugh’s confirmation looming she thinks she should say something. She’s had a degree in Clinical Psychology? Even when they prove him innocent, the Democrats are still going to vote no anyway. Big waste of time. I say go ahead and vote now. Reporters Shout At Sarah Sanders As She Enters The State Dinner With France -Her Answer Made Them Regret Their Decision!